Adopting a V-12 engine has given Yak’s trainer family a new look. Throughout the early Cold War era, most Eastern bloc pilots took their first training flights in the classic Yakovlev Yak-18 trainer. From the mid-1970s the all-metal Yak-52 entered service to provide elementary training, and is still in limited use today with DOSAAF, Russia’s military-affiliated aero club organization. Now the Russian air force is procuring a new generation of Yak trainers to provide new equipment for DOSAAF. 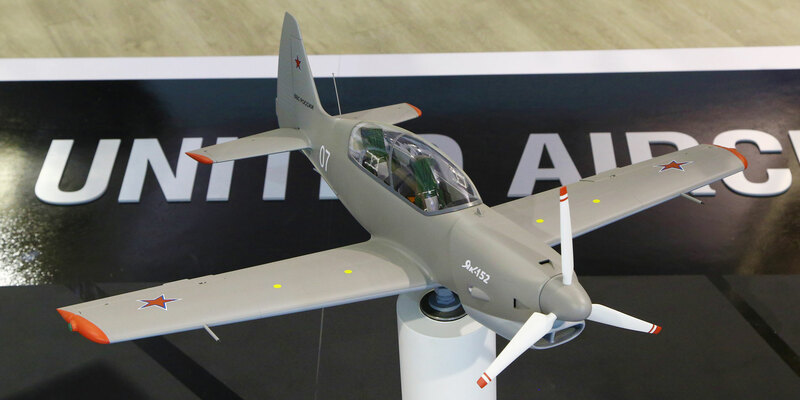 Being displayed at Singapore for the first time in model form as part of the United Aircraft Corporation exhibit, the 3,285-pound (1,490-kg) MTOW Yak-152 is a tandem two-seat trainer with a 500-hp Raikhlin Aircraft Engine Developments (RED) A03 diesel engine. This modern powerplant was developed in Germany, and its initial flight tests were undertaken in a converted Yak-52. The engine’s V-12 layout marks a departure for Yakovlev’s trainers, which have almost universally been powered by various Ivchenko/Vedeneyev radial engines. Development of the Yak-152 began in the late 1990s for a Russian air force requirement, losing out to the Sukhoi Su-49 design in 2001, although that program was ultimately shelved. The Yak-152 design was subsequently reborn, in collaboration with Hongdu, to fulfill a Chinese trainer requirement. A prototype of the Hongdu/Yakovlev CJ-7 first flew in late 2010, powered by a Vedeneyev M-14X radial engine. In 2014, the Yak-152 was resurrected for a new Russian requirement. The RED A03-powered aircraft answers the “Ptichka VVS” requirement for an elementary trainer and pilot screening aircraft. It forms part of the UTK-Yak training complex with the Yak-130 jet trainer, simulators and classroom trainers. Yakovlev has always prided itself on the aerobatic capabilities of its trainers, and the Yak-152 has G limits of +8/-6 with two on board, or +9/-7 with one. The aircraft has a top speed of 310 mph (500 km/h), a range of 932 miles (1,500 km) and a landing field requirement of 1,380 ft (420 m) on a hard runway and 1,230 ft (375 m) on grass. The Yak-152 is fitted with the Zvezda SKS-94M2 escape system. Following the construction of a mock-up in 2014, Yakovlev is producing four prototypes for trials, including static and fatigue test specimens. Flight trials with the two flying prototypes are scheduled for this year, with production likely to start in 2017. Russian requirements are for around 150 aircraft to replace Yak-52s.